We are among the veterans in the industry for manufacturing and supplying Central Exchange Type Paging and Talk Back System. The offered product is equipped with a desktop operator console, micro controller unit and a relay bank. It is exceptional in performance and is used in industries for public addressing. This system is rich in features and provided with selective calling, group calling and conference calling. Features: Selective call Conference call Group call All call Emergency siren Can communicate with the Stations in different groups. Date and Time Updating facility. Standby mode operation Compact and easy to handle. 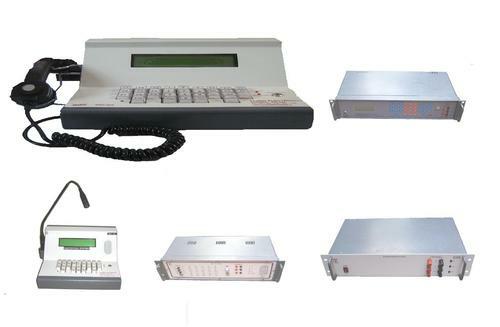 Alert Tone To accommodate 20 / 40 / 60 Field Call Stations / Zones Display of calling Station ID (Number) Provided with soft key pad Ergonomically designed for ease of operation and provided with powder coated MS enclosure suitable for industrial environment Available with Handset model / Gooseneck mic model. For more details about the product, see the PDF file here. * Successfully functioning as the manufacturer of Industrial Audio Communication - Paging & Talk back - systems, system integrator, supplier and trader of industrial electronic processing and test & measuring equipments. * Our products are highly regarded for being durable, effective in performance and latest in technology. railways, department of space, department of atomic energy etc.